Not all whirlpool baths are made the same! 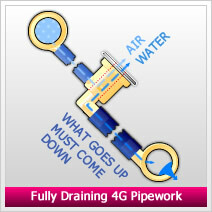 We are so proud of our 4G pipework that, unlike many of our competitors, we are happy to show it off. Take a look at the 360° spin below! 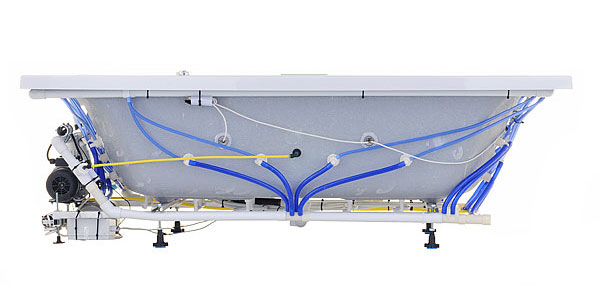 4th generation pipework (4G) is the latest evolution of our Pegasus whirlpool bath pipework. Click on & drag the bath image opposite to spin it & see our 4G pipework from every angle. Working on the principle of what goes up must come down, the Pegasus unique 4th Generation whirlpool pipework is designed so that the water is pumped upwards rather than horizontally as in other systems. When the bath is emptied, the pump and pipework will drain completely. Just to make sure that every last drop has gone, our top of the range Sensations whirlpool has a heated blower that is programmed to automatically purge the pipework of any remaining water droplets a few minutes after the bath has emptied. Maintenance of any Pegasus 4G system consists of flushing the system with our whirlbath cleanser six or seven times a year depending on usage - we include a free hygiene pack with every system. 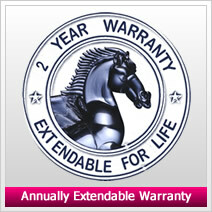 At the end of the warranty, most of our competitors will say goodbuy to their customers. We don't! The exceptional pride and quality we have built into our systems doesn't stop at the end of two years, we will also provide incredible after sales support too. At the end of the initial warranty, you have a choice of extending your warranty on an annual basis for as long as you wish! A simple small payment each year will give you peace of mind, there is no limit to our extended warranty - We wouldn't want you to buy a whirlpool bath from us which we wouldn't be proud to have in our own homes and we want you to continue the enjoyment of our bath for the life of your bathroom, not just for the first two years! Pegasus Sensations Whirlpool Baths provide all the therapy you could possibly desire - Hydrotherapy, Chromotherapy and Aromatherapy. The Pegasus Sensations Whirlpool system has been developed with the benefit of our Managing Director's 27 years experience in manufacturing & servicing Whirlpool Baths together with feedback we have received from our customers. The result is a luxurious Whirlpool Bath which combines Performance, Reliability, Hygiene & Functionality. The Sensations Whirlpool has been designed to meet our very strict criteria in terms of Performance, Reliablity, Hygiene and Functionality. Pegasus Whirlpool Baths are setting new high standards with their Sensations system!. Pegasus Sensations Whirlpool Baths begin with 8 turbo jets as standard and are known as our Turbo Sensations system. Back jets and leg patterns can be then added to your desire. By adding an air spa, the system then becomes a Hydro Sensations whirlpool. Below is breakdown of the two different systems. All Pegasus Sensations™ whirlpool baths start with 8 jets (4 either side). You have the option to add more whirlpool jets (up to 48 in total). These jets can be positioned anywhere you like on your bath so you can target specific areas of the body. This system has two massage systems: Whirlpool & Turbo Whirlpool. 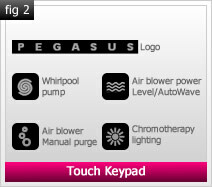 Up to four chromotherapy lights can also be added to any Pegasus Sensations™ whirlpool bath. These are a very popular addition & add instant mood. With choromotherapy lights, you are in control of whatever atmosphere & mood you desire in your bathroom. 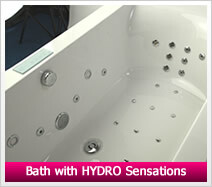 If you choose to add Spa jets to the base of your bath, it becomes a Hydro Sensations system (see below). As Turbo Sensations™ however, an additional 18 nozzles in the base of the bath are added which inject air into the water giving a buoyant effect, this provides a further three massage options: Spa, Combination Whirlpool & Spa, plus Hydro-pool (Turbo Whirlpool & Spa). The Pegasus Sensations™ whirlpool bath controls are a state of the art, touch sensitive glass touch pad control that has multifunctional buttons that are used to control the plentyful features that our Pegasus Sensations™ has. below is a brief breakdown of the main setting & features. Click here to download the full user instruction booklet. The glass, touch pad control comprises of four main multifuntional buttons. It's connected to the system via a 230 volt A/C power module that is consealed in a water tight box within the confinds of the bath. The power module also provides the power for the pump, blower & RGB spot light. 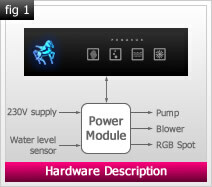 The water level sensor is also connected to the power module(fig 1). Whirlpool Pump - Long press: starts/stops the Whirlpool pump. Air Blower on/off & Manual Purge - Long press with water level: starts/stops the blower (starts at medium power level). Long press with empty tub: forces a Manual Purge. Air Blower Power Level / AutoWave - Enabled only when the blower is on. Short press: selects the blowers power level (5 levels). Long press: starts/stops the Auto Wave. 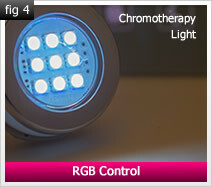 Chromotherapy Lighting - Selects the RGB colour (fixed colour or colour programme). Logo - Control Status Indication: Fixed white: Idle mode (standby), no water level, all functions off. Fixed blue: Ready mode, water level detected. Flashing red: low water level alarm while pump and/or blower are active. Flashing blue: Pipework purge sequence in progress(fig 2). Water level detection - The system detects the water level by a capacitive level sensor. The level signal must be stable for 3 seconds before the control validates it to limit false triggering. Pump control - The pump is started / stopped by a long press of +. In case of no water level, the button is disabled. When the pump function is active, the button is BLUE, when off the button is WHITE. Blower control - The blower is started / stopped by a long press of +. In case of no water level, the button is disabled. When the blower function is active, both the button + & + are BLUE. When off, both buttons are WHITE. The user can select 5 different power levels. The blower starts at power level 2. All power transitions are gradual to limit inrush current over the mains power line. Once the blower is on, it is possible to: 1. Adjust the power level by pressing + (short press). This will cycle all the 5 levels. 2. Start/stop the AutoWave level by pressing + (long press). Auto Wave - Once the blower is started, pressing + for 1.5 seconds will start / stop the Auto-Wave mode. 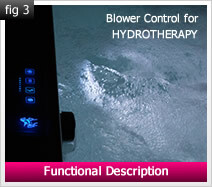 The blower automatically cycles it's power level producing a wave effect in the tub. (fig 3). The control is capable of driving up to two RGB spots in paralle. Spotlight control is not tied to water level, so the user can start/stop the RGB function at any time by a long press of +. When the RGB function is on, the button is BLUE, otherwise is WHITE. As the RGB is started, the first colour is WHITE (full colour), then the user can select a different fixed colour or a colour program by pressing + (short press)(fig 4). Click here to download the full user instruction booklet.